a. Ensure all nuts/bolts are securely fastened. c. Check and replace spark plug if necessary. d. Check and adjust chain tension if necessary. f. Check all cables/controls for proper operation. g. Lube all fittings/chain as necessary. f. Check and adjust Valve Clearances if necessary. g. Check all cables/controls for proper operation. h. Lube all fittings/chain as necessary. h. Flush and replace brake fluid. *This advice especially relates to children on smaller ATVs but applies equally to beginners of all ages. *Instructing the rider. *Important advice to parents, teachers or instructors. 1. Have student sit on ATV. 2. Instruct student to keep his/her eyes straight ahead while you slowly push the vehicle from behind. This will give the student of riding a moving vehicle. 3. As you push the ATV, instruct your student to steer straight ahead and perform operations such as stopping the vehicle and turning OFF the engine switch while moving. Watch your student closely to make sure she/he is operating the controls correctly and without looking at them. 4. As you approach the end of the practice area, tell your student to stop the vehicle. You should drag the rear end of the ATV around so you can push it straight ahead in the opposite direction. 4: ADJUST THE SPEED LIMITER TO SLOW NOW. Next start the ATV's engine and have the student practice starting off, riding in a straight line and stopping with the vehicle under power. Walk alongside the ATV and hold the engine cutout switch cord or have the student ride back and forth between you and another supervising adult. Make sure your student: 1. Opens the throttle gently when starting off. 2. Releases the throttle and applies the brakes in sequence when stopping. 3. Becomes aware of the distance it takes the vehicle to stop when the engine switch is turned OFF while the vehicle is moving. As you approach the end of the practice session, you should again tell the rider to stop the vehicle and get off so you can turn it around for him/her. Practice this exercise until your student can start off, accelerate, cruise and stop correctly and confidently. STEP 5: TURNING: After your student has learned to ride the ATV in a straight line and can stop it at will, you should teach the student how to turn the vehicle. Explain the proper body movements for turning and let the student PRACTICE FIRST WITH THE ENGINE OFF as you push the vehicle from behind. When turning, watch to make sure your student: 1. Shifts his/her weight slightly forward and supports his/her weight on the outer footrest. 2. Leans his/her upper body into the direction of the turn, pressing down with the opposite leg. When the rider is able to properly turn the ATV in both directions with the engine OFF, she/he should practice turning with the vehicle under power. Again, make sure that the throttle limiter is adjusted to provide a low maximum speed capability. Watch closely to make sure the rider is using the proper technique. The rider should practice turning until s/he can do so correctly and confidently. STEP 6: PUTTING IT ALL TOGETHER when your student has mastered the basic riding maneuvers in the previously listed steps, she/he should practice them all together. Instruct the student to perform various maneuvers such as turning right, turning left, stopping, etc. Vary the order of these maneuvers so the student will not anticipate what s/he will be asked to do next. Practice this exercise until you are confident that the rider has mastered all the basic maneuvers. Using this procedure will help the first-time rider learn the most basic riding techniques. To become a skilled rider, your student will need a great deal of practice and continuing instruction in addition to completing these introductory steps. After all the riding techniques have been mastered, you can adjust the throttle limiter to provide higher speed capabilities in keeping with the rider skill and experience. PLESE READ THESE INSTRUCTIONS VERY CAREFULLY BECAUSE IT WILL TELL YOU WHAT TO DO, WHAT NOT TO DO, TIPS, CHECKLISTS, PARENTS GUIDE, PDI. ETC. PLEASE READ THESE TIPS BEFORE RIDING YOUR NEW RIDE. YOU MUST THE FOLLOWING !!! 1. MAKE SURE EVERY NUTS AND BOLTS ARE LOCK TIGHT (BLUE COLOR). 2. AFTER 4 TO 5 HOURS DRIVING YOU MUST CHANGE THE OIL TO 10 W 40. 3. MUST INSPECT EVERYTHING BEFORE EACH RIDE. 5. DO NOT EXCEED ITS WEIGHT LIMIT. 7. DO NOT EXCEED ITS SPEED LIMIT. 10. CHANGE YOUR REVERSE GEAR WHILE COMING TO A COMPLETE STOP. 11. 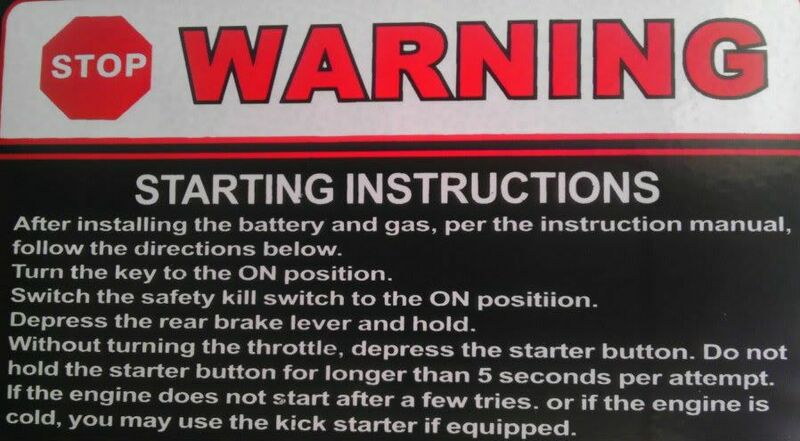 ADDITION TO THESE TIPS PLEASE READ YOUR OWNER MANUAL. I HAVE READ AND EXPLAINED TERMS AND CONDITIONS. 8)turn on gas petcock (located on right side of carburetor, turn clockwise to on-it allows gas to fill the gas lines and the bottom of the carburator). Some models- this is not necessary because there is no gas shutoff valve=petcock. 2. Instruct student to keep his/her eyes straight ahead while you slowly push the vehicle from behind. This will give the student the knowhow of riding a moving vehicle. 5. Practice with the engine OFF until your student gets the hang of using the brakes and can stop the vehicle and turn OFF the engine switch without hesitation and without looking at the controls. STEP 4: ADJUST THE SPEED LIMITER TO SLOW NOW. Next start the ATV engine and have the student practice starting off, riding in a straight line and stopping with the vehicle under power. Walk alongside the ATV and hold the engine cutout switch cord or have the student ride back and forth between you and another supervising adult. Make sure your student: 1. Opens the throttle gently when starting off. 2. Releases the throttle and applies the brakes in sequence when stopping. 3. Becomes aware of the distance it takes the vehicle to stop when the engine switch is turned OFF while the vehicle is moving. As you approach the end of the practice session, you should again tell the rider to stop the vehicle and get off so you can turn it around for him/her. Practice this exercise until your student can start off, accelerate, cruise and stop correctly and confidently. STEP 5: TURNING: After your student has learned to ride the ATV in a straight line and can stop it at will, you should teach the student how to turn the vehicle. Explain the proper body movements for turning and let the student PRACTICE FIRST WITH THE ENGINE OFF as you push the vehicle from behind. When turning, watch to make sure your student: 1. Shifts his/her weight slightly forward and supports his/her weight on the outer footrest. 2. leans his/her upper body into the direction of the turn, pressing down with the opposite leg. When the rider is able to properly turn the ATV in both directions with the engine OFF, she/he should practice turning with the vehicle under power. Again, make sure that the throttle limiter is adjusted to provide a low maximum speed capability. Watch closely to make sure the rider is using the proper technique. The rider should practice turning until s/he can do so correctly and confidently. STEP 6: PUTTING IT ALL TOGETHER when your student has mastered the basic riding maneuvers in the previously listed steps, she/he should practice them all together. Instruct the student to perform various maneuvers such as turning right, turning left, stopping, etc. Vary the order of these maneuvers so the student will not anticipate what s/he will be asked to do next. Practice this exercise until you are confident that the rider has mastered all the basic maneuvers. Using this procedure will help the first-time rider learn the most basic riding techniques. To become a skilled rider, your student will need a great deal of practice and continuing instruction in addition to completing these introductory steps. After all the riding techniques have been mastered, you can adjust the throttle limiter to provide higher speed capabilities in keeping with the rider skill and experience. c. Check and adjust chain tension if necessary (initially there will be chain ). I. On water-cooled vehicles Flush and replace coolant. Dealers/Retail End Users: Following these Manufacturer's warranty Service Items/Intervals will help to ensure smooth, efficient and fun operation of your vehicles. NOTE: This warranty does not cover neglect, abuse, misuse or negligence or damaged parts from accidents or shipping. Warranty does not include all wearable parts including, but not limited to: brakes, tires, batteries and body parts. ATV Racing Oil You may hear mechanics and wannabes alike claiming that oil changes are less important then ever thanks to tighter tolerances and advances in oil lubricants. While these claims may be true to a certain extent, break in is certainly not the time to experiment. Proper break-in of a new ATV engine is an essential aspect to the vehicle's longevity. The key to successful break-in is to ride the quad easy but not so mellow that the rings can't seat within the cylinder. The best way to do this is to combine a high load with low RPM. In other words lug the engine a bit by riding smoothly in a higher gear then necessary as opposed to popping it into one gear and revving it out. The oil that comes inside your engine will be adequate for the first few hours of break in but conduct a thorough oil change immediately after. It's not a bad idea to consider a synthetic blend even over a full synthetic. Make certain to run motorcycle or ATV specific oil blends as the yare designed to lubricate the clutch (this is known as a wet clutch) as well as the engine's internals. Automotive oil and full synthetics may be adequate at lubing up the engine but usually lead to clutch slippage. Step 2: Lube Away ATV Chain LubeSure your ATV was greased at all of the pivots before leaving the factory but this grease is designed to withstand overseas shipping and initial break-in operation. Asking it to endure for the life of the machine is simply looking for trouble. Not to mention that all it takes is a little contact with the water from a pressure washer to blast this lubrication away. It's always a good idea to check any and all exposed bearings and pivots (swing arm linkage for example) and to apply a thick slosh of quality waterproof grease on these areas BEFORE they show signs of compromised performance. The common mistake is to wait until bearings begin to squeal or drag before paying attention to them and by then it's almost always too late. ATV ChainIt's quite normal for the quad's chain (shaft and belt drive units need not apply) to stretch a bit during those first few rides. However, just because a bit of additional slack is normal, it's critical to check to make sure it hasn't become too loose. It's a good practice to get in the habit of keeping a small ruler in your toolbox for this specific purpose. This way, whenever you lube the chain, you can measure and jot down the amount of slack present. Your vehicle's owner's manual will provide the proper range of movement expected before the chain will require tightening or replacement (depending on how many times you've tightened it before). 8) turn on gas petcock (located on right side of carburetor, turn clockwise to on-it allows gas to fill the gas lines and the bottom of the carburator). Some models- this is not necessary because there is no gas shutoff valve=petcock. c. Check and adjust chain tension if necessary (initially there will be â€œchain stretchâ€). I. On water-cooled vehicles â€“ Flush and replace coolant. ealers/Retail End Users: Following these Manufacturerâ€™s warranty Service Items/Intervals will help to ensure smooth, efficient and fun operation of your vehicles. NOTE: This warranty does not cover neglect, abuse, misuse or negligence or damaged parts from accidents or shipping. Warranty does not include all wearable parts including, but not limited to: brakes, tires, batteries and body parts. ATV Racing Oil You may hear mechanics and wannabes alike claiming that oil changes are less important then ever thanks to tighter tolerances and advances in oil lubricants. While these claims may be true to a certain extent, break in is certainly not the time to experiment. Proper break-in of a new ATV engine is an essential aspect to the vehicle's longevity. The key to successful break-in is to ride the quad easy but not so mellow that the rings canâ€™t seat within the cylinder. The best way to do this is to combine a high load with low RPM. In other words lug the engine a bit by riding smoothly in a higher gear then necessary as opposed to popping it into one gear and revving it out. The oil that comes inside your engine will be adequate for the first few hours of break in but conduct a thorough oil change immediately after. Itâ€™s not a bad idea to consider a synthetic blend even over a full synthetic. Make certain to run motorcycle or ATV specific oil blends as the yare designed to lubricate the clutch (this is known as a wet clutch) as well as the engineâ€™s internals. Automotive oil and full synthetics may be adequate at lubing up the engine but usually lead to clutch slippage. ATV Chain LubeSure your ATV was greased at all of the pivots before leaving the factory but this grease is designed to withstand overseas shipping and initial break-in operation. Asking it to endure for the life of the machine is simply looking for trouble. Not to mention that all it takes is a little contact with the water from a pressure washer to blast this lubrication away. It's always a good idea to check any and all exposed bearings and pivots (swing arm linkage for example) and to apply a thick slosh of quality waterproof grease on these areas BEFORE they show signs of compromised performance. The common mistake is to wait until bearings begin to squeal or drag before paying attention to them and by then itâ€™s almost always too late. ATV ChainIt's quite normal for the quad's chain (shaft and belt drive units need not apply) to stretch a bit during those first few rides. However, just because a bit of additional slack is normal, itâ€™s critical to check to make sure it hasn't become too loose. It's a good practice to get in the habit of keeping a small ruler in your toolbox for this specific purpose. This way, whenever you lube the chain, you can measure and jot down the amount of slack present. Your vehicle's ownerâ€™s manual will provide the proper range of movement expected before the chain will require tightening or replacement(depending on how many times youâ€™ve tightened it before). If you find yourself in a situation where you can't access a ruler to measure the amount of slack, the rule of thumb is typically no more than two to three finger widths of vertical movement.